Our next meeting will be on Tuesday 17th April, at the Horse and Jockey pub in Stanford-in-the-Vale. As usual, we will be playing shorter games from 7.30pm as people arrive, until 8pm when we will start something a little longer. This week the “Feature Game” will be Mini Park. 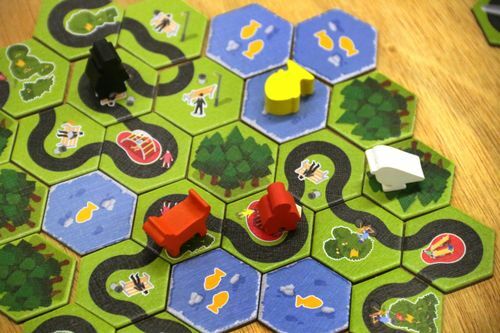 This is a very quick, light tile-laying game from Taiwan that was popular at Essen last year. Players take on the role of architects designing a new park, taking it in turns to either place a tile or add a character. This entry was posted in Next Meeting on April 17, 2018 by nannyGOAT.